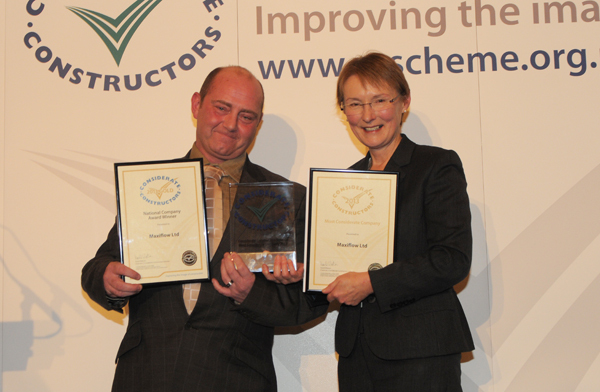 At the Considerate Constructors Scheme’s National Company Awards 2013, Maxiflow Ltd were awarded the prestigious title of Most Considerate Company 2013. Maxiflow were judged to have put in place the most considerate standards of construction and made the greatest contribution towards improving the image of construction. Due to their efforts, they were presented with both a Gold Award and the most considerate title. Maxiflow first registered with the Scheme in 2009 and have remained a registered company ever since. Based in Chester, they provide a wide range of services for commercial and domestic clients, with specialist divisions focusing on building, roofing, drainage, mechanical & electrical and solar energy contracting. Though the Scheme reviews the company’s considerate performance as a whole, the Scheme’s Monitors visit a small selection of their projects to make the assessment. One such project visited by a Scheme Monitor was the refurbishment of an old toilet area into a fully-equipped disabled toilet unit within an existing day care centre which caters for dementia sufferers. Although this was a particularly short duration project, the company demonstrated its real commitment to delivering a quality product to considerate standards. The work area was particularly restrictive, but the insertion of a discrete door lock to prevent dementia-suffering day care patients inadvertently entering the area was commendable, as was the use of the zipped dust sheet affixed to the door frame. With the addition of innovative directional signs, exceptional cleanliness and a highly co-operative stance, the operation demonstrated that even a small site can do something special. In addition to the company itself supporting various local organisations, the Scheme Monitor noted several examples of local fund-raising activities carried out by individual employees, showing that the culture of support for the community runs throughout the company. This is also reflected in the company’s recently-launched Accesswatch scheme, a website and mailing list which aims to keep members of the public informed about scaffolds, excavations and other access-impairing works carried out by Maxiflow. Combined with elements such as supporting staff in gaining additional qualifications and offering a number of health services, this company’s considerate effort was of an exceptionally high level and a great example to the industry of what can be achieved on the smallest projects. All of us at Maxiflow consider winning a Gold Award and being named Most Considerate Company to be incredible achievements. We are truly honoured to have been considered as contenders for both awards, and the fact that we took home double gold is astounding. I would like to thank each and every member of our team for the daily, ongoing commitment that has produced such amazing results. This win instils us with great confidence in our direction as a company, and is a confirmation that our community-focussed approach is one of our greatest strengths. Many congratulations are due to Maxiflow who have demonstrated that even the smallest site can achieve real consideration in the way it conducts the work required. This is an exceptional performance and of great credit to the industry.